Best advice: Live simply, give much. In 2012 Duncan Ward met the man who’d change his life. Bunrith Thy, affectionately known as Racky, was Cambodian. He’d been stolen from his family as a five-year-old under the Pol Pot regime. He’d worked as a child slave. He’d escaped three attempts on his life. He’d somehow put himself through school. And, realising the opportunities that education had provided him, he’d dedicated his life to educating the next generation. Duncan was awestruck by Racky’s selflessness. Duncan had spent his 20s climbing the corporate ladder. And he’d done well. But for some time now, he’d had this aching feeling there must be something more. Since his brother had passed away in 2008, Duncan knew he wanted to grasp life with both hands, to do something for people and the planet, to make a difference. Searching for purpose and meaning, in 2008 Duncan threw away his full-time corporate job and embarked on what would become several-year backpacking adventure through South America, Asia and Africa. He would return home to Australia for another contract to earn more money, then set off again, ever searching. He found himself drawn to the issue of poverty, and felt an urge to help poverty-stricken children. So, when he met Racky in Cambodia in 2012 and learned about the work he was doing to school Cambodian kids, Duncan had found the cause he’d been looking for. Talking to Racky beside a football field, watching kids race around in the dirt, Duncan learned that Racky was taking tourists on guided tours of his homeland to raise the money he needed to put as many kids as he could through school. He was spending his own money on educating kids he hardly knew. And he was making a big difference to individual lives. Racky dreamed of helping more children. Yet he was stifled through a lack of funding. As Duncan listened to Racky share his dreams, he was overcome with the urge to help. He promised to do whatever it took to help Racky ensure Cambodian kids received an education. The seeds for Classroom of Hope were sown. Back in Australia, Duncan returned to his corporate career, spending his days at work while cramming his evenings and weekends with research and work towards forming a not-for-profit. He read everything he could on fundraising. Eventually he launched Classroom of Hope as a charity. Duncan started fundraising, scratching together $63,000 in a year. He also discovered the organisation Kampuchean Action for Primary Education (KAPE) – a non-government organisation also working to improve education in Cambodia. Duncan presented Racky’s case to KAPE. 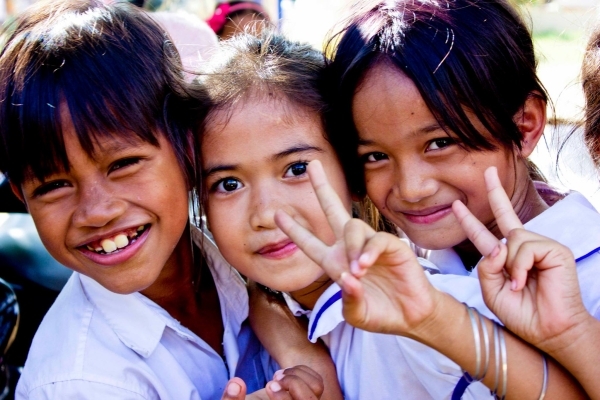 And with KAPES’ help and Classroom of Hope’s funding, they embarked on a program to transform 15 Cambodian schools. Cambodian school girls on scholarship. In the meantime, Duncan met a young Canadian woman, Nicola Courtin, who would go onto become not only his wife but also Classroom of Hope’s biggest supporter. Duncan had spied Nicola dozing on a bus travelling in Laos and decided to introduce himself. They kept in touch afterwards via Facebook, but it wasn’t until another year later that they chatted again, via Skype. Several visits and years later, the duo could deny their attraction no longer. They recognised not only kindred spirits in each other, but also a shared desire to contribute to, and make an impact on, their world. Nicola and Duncan in a Cambodian classroom. After living together in Perth, working at ‘paid’ jobs while raising money for Classroom of Hope on the side, Nicola and Duncan began to despair. They were working hard, oh so hard, to raise money to restore dilapidated schools, train teachers and offer scholarships in Cambodia. Yet the cost of living in Perth was so high that they found themselves constantly struggling. Until Duncan had an idea. It came to him as they drove home along a long stretch of rural road in Western Australia. He stopped the car. As he shook Nicola awake in the front seat, Duncan’s words tumbled out in enthusiasm. Why not move somewhere cheaper, he blurted? They’d need just a fraction of their current wages to survive. And the reduced cost of their own living expenses would mean they could dedicate more to building a sustainable organisation and in turn educate more children. Rubbing the sleep from her eyes Nicola laughed at Duncan’s enthusiasm. She agreed. In April 2016, the duo moved to Bali to run Classroom of Hope from a one-bedroom villa. They also launched a new fundraising initiative, Wise Owls, in which people who believe in their work fund their operating costs, to enable every extra dollar they raise to go directly to educating children in need. The new, cheaper living arrangements and Wise Owls funding meant they could dedicate themselves to Classroom of Hope full time. They were finally in the position to make the impact of which they’d dreamed. Today, Classroom of Hope has supported more than 9000 kids and 200 teachers in 29 schools. It has transformed dilapidated school buildings into modern premises. It has built two new schools. It has ensured the schools in which its works meet UNICEF standards for ‘child friendliness’. It has distributed scholarships to 620 kids. And it has funded 10 young women into science, technology, engineering or maths university placements. 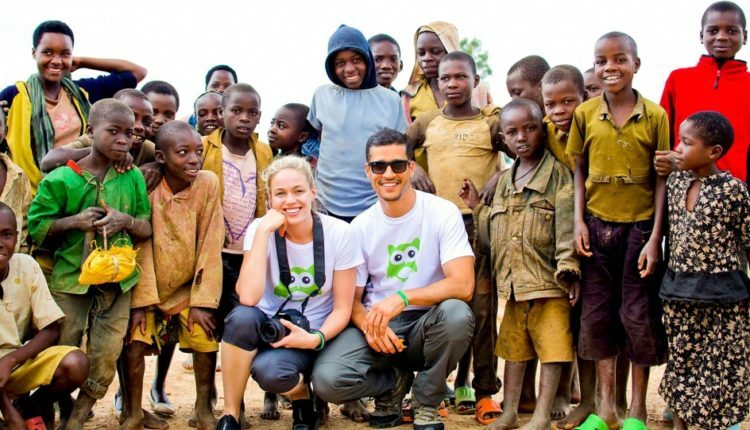 Along the way, Duncan won the Australian Talent Unleashed Impact award from Sir Richard Branson in 2013 and also a 40under40 award winner in 2016 for his work with Classroom of Hope. But it’s not the awards or the statistics that light them up. It’s the individual stories of transformation. Nicola loves the case of one boy called ‘Mr Bai’. She and Duncan met him among a group of kids who’d pulled together to clean up their school after wet season flooding. While most of the kids delighted in the task, clearly revelling in their return to school, one boy lacked the enthusiasm of the others. They discovered the boy would not be returning to school. His family needed him to work on the boats to earn a living. This was exactly the kind of child they sought to help. So they organised to fund his education, and financially support his family to make up for the lost wages. Mr Bai’s life transformed. He has now become, not the boat worker he’d once envisaged, but a monk dedicated to helping others. While Duncan and Nicola now have a baby of their own, they cannot imagine ever giving up Classroom of Hope. Indeed, they’ve now expanded Classroom of Hope into Rwanda, Thailand and Indonesia with plans to build schools in Laos and Myanmar. While they are always looking to the future, they sometimes reflect on how much they’ve achieved. One such moment of reflection occurred at a ceremony marking the start of work on seven new schools in 2013. Some 400 people crowded the ceremony. Buddhist monks blessed the primary school. Confetti drifted through the air. And Racky was overcome at seeing his dream become reality. But Duncan and Nicola also realised their work was far from over.